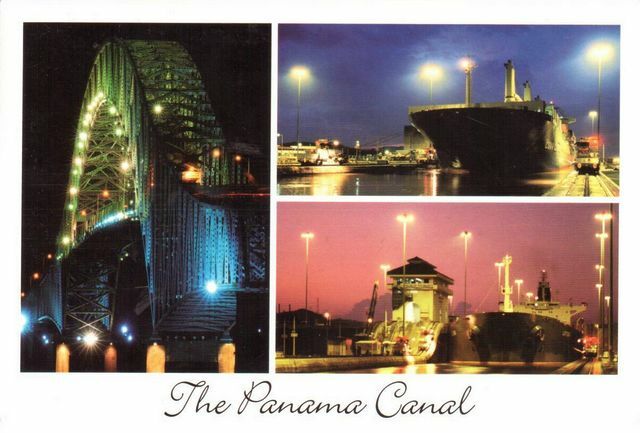 The Panamá Canal is a 48-mile (77 km) ship canal in Panama that connects theAtlantic Ocean (via the Caribbean Sea) to the Pacific Ocean. The canal cuts across the Isthmus of Panama and is a key conduit for international maritime trade. There are locks at each end to lift ships up to Gatun Lake, an artificial lake created to reduce the amount of excavation work required for the canal, 26 metres (85 ft) above sea level. The current locks are 33.5 metres (110 ft) wide. A third, wider lane of locks is currently under construction and is due to open in June 2016. One of the largest and most difficult engineering projects ever undertaken, the Panama Canal shortcut greatly reduced the time for ships to travel between the Atlantic and Pacific Oceans, enabling them to avoid the lengthy, hazardous Cape Horn route around the southernmost tip of South America via the Drake Passage or Strait of Magellan.